August can be a hectic time with getting children ready for a new school year, so come recharge your batteries with us at the garden. Feel the weight lift from your shoulders as you wander the grounds, exploring the native and non-native plants that make us unique. 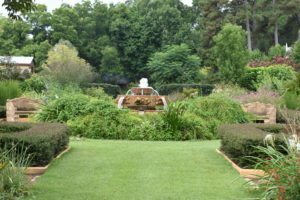 Stop at the formal garden fountain or in the Spring House, take a deep breath and look at the beauty around you. There’s something new around every corner.